Well-built and powerful, if you run any kind of professional software, from video editing tools to CAD or CAM, the PW-E7F will not disappoint. Entering the professional workstation market seems to be a natural progression for component vendors, who normally sell fully built gaming PCs as well as the individual parts. As Overclockers is such a well-established UK retailer, if anything, it's surprising that it has taken this long for the company to do so. Workstations aren't the same as gaming PCs though. The big difference is that a workstation will come with a FirePro or Quadro professional graphics card, which can cost many times more than AMD's Radeon and Nvidia's GeForce gaming products. Although the physical differences between the two categories of graphics card are minimal, because workstations are aimed at people who depend on their computer's 3D performance for their livelihood, reliability and software compatibility matters more than performance alone. There's the option of ECC memory on a FirePro or Quadro, and certified drivers that have been fully tested with applications such as Maya and 3ds Max before release. OpenCL acceleration (and Cuda in Nvidia's case) of certain software products is also more of a consideration with a professional graphics card. The PW-E7F comes with a FirePro W8100, which is the second-fastest professional card in AMD's lineup. It has 8GB of GDDR5 video memory and 2,560 shader processors, AMD's unified parallel compute units. FirePros are generally brilliant with OpenCL-accelerated software tasks, favoured by many software applications nowadays over Nvidia's Cuda, which is supported on Quadros only. If you'd prefer a Quadro, or a less high-end graphics card, the full range is available on the RENDA customisation page. The PW-E7F comes with an Intel Core i7-5960x processor, the top-end eight-core processor from Intel's Haswell-E line. With eight processor cores, it bridges the gap between Intel's desktop processors and workstation-focused Xeon chips. There aren't huge technical differences between Xeons and Core i7 processors. Xeons can use ECC memory, and the Xeon E5 processors can be used in dual-socket motherboards that support two CPUs. That sort of configuration is really only found in ultra-high-end workstations, which usually carry five-figure price tags. A workstation with a pair of Xeon chips inside it could offer up to 40 processor cores, and a truly astonishing level of performance in highly parallel, multi-threaded software. But this is overkill for people who might not be using multi-threaded software exclusively. What's more, Xeon processors usually run at slightly slower clock speeds than Core i7 chips. The venerable quad-core Core i7-4790k runs at a clock speed of 4GHz, which is a great deal quicker than most Xeon processors, which languish around the 3GHz mark, and many software applications will run better with a faster-clocked CPU than with dozens of CPU cores. The Core i7-5960x is a great choice for the RENDA PW-E7F then. Its eight cores still give it a decent ability to handle multiple threads in long rendering jobs, for example, but with the 4.3GHz overclock applied, it's blisteringly fast at all other processing tasks too. If you want a Xeon-based system, Overclockers has a few different models listed, some with dual processors such as the PX-6, along with more entry-level Core i5 systems. An Asus X99-E WS workstation motherboard holds it all together, a variant of the firm's popular LGA 2011-v3 enthusiast motherboard. It's stuffed full of features and expansion options. There are seven PCI-Express slots, 10 rear USB 3.0 ports, a dozen SATA 3 ports and a pair of SATA Express ports, along with a single M.2 slot supporting x4 PCI-Express. 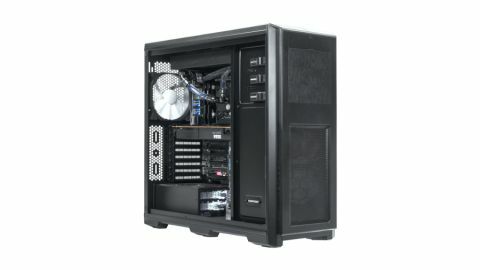 This review model costs £4,114 (around $6,180, or AU$7,930), which is typical for a high-end workstation. Desktop workstations from big-name vendors such as Dell, Fujitsu, HP and Lenovo normally use a custom-built chassis, often with removable sections to facilitate easy upgrading. Independent system builders such as Overclockers instead rely on off-the-shelf cases, no different from the kind you or I might have for our home PC. Air-cooled RENDA workstations come in Lian Li aluminium cases, while the water-cooled varieties, including the PW-E7F, are supplied in a hefty Phanteks chassis, which has a bit more internal space for the radiators, tubing and other garb that's required for a water-cooled rig. The build quality is top notch, as expected. Overclockers has gone to some serious effort to ensure not a single cable is left hanging anywhere that obscures access to the insides of the PW-E7F. The SATA and power cables are carefully routed around holes in the case. Of course, this level of tidy cable management isn't beyond the skills of many home PC builders, and just requires some time and effort to get right. But when paying good money for a PC to be built for you, it's something that a vendor should be expected to do, and Overclockers has certainly done well here. A 1200 Watt SuperFlower LeaderX power supply, rated as "80-plus platinum pro" guarantees even an overclocked processor and top-end graphics card won't be a problem, while giving the flexibility to add additional graphics cards or storage. By default, a 256GB Samsung 850 Pro SSD and a 2TB Seagate Barracuda hard disk are included, although if you're spending this amount of cash, it makes sense to pay a bit extra and order a larger SSD, perhaps even 1TB if you'll be working with gigantic media files. There's 32GB of DDR4 RAM on board. The water-cooling setup comprises of water blocks and a triple radiator from EK, and a Bitspower tank (reservoir). This is a break from the traditional approach of workstation vendors, for example Scan uses all-in-one closed-loop water coolers from Corsair for its 3XS systems. One of the advantages of water cooling is a much tidier system and easier access to the internals than is afforded by a giant heatsink and fan in an air-cooled workstation, and it's pretty efficient as well. The reservoir is visible to the lower right of the CPU, and when the PW-E7F is turned on it really looks awesome. That said, looks are arguably less important for a workstation than a gaming PC, and what matters is efficiency and quiet operation. Here's where the PW-E7F falls down a bit. With so much silicon, the three 120mm fans have their work cut out, and the result is a definite low hum when the workstation is powered on. It's not enough to seriously complain about, but is noticeable. Having tested quite a few desktop workstations of equal or greater processing capacity, I can say the PW-E7F isn't the loudest I've used, but it's definitely not the quietest either.